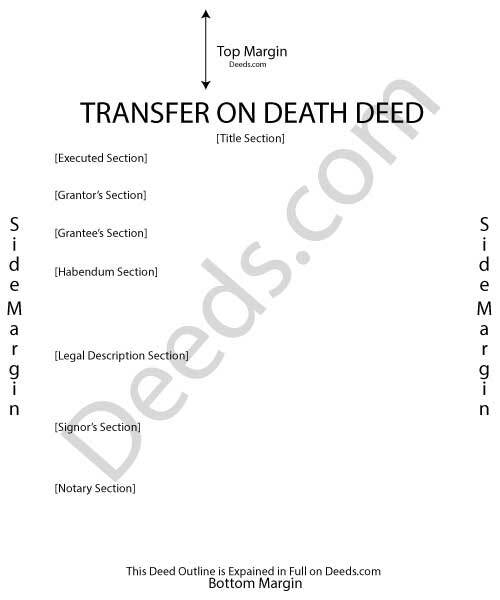 Transfer on Death Deed - Setting up real estate to be transferred upon your death. Real estate is often one of the most significant assets to consider in a comprehensive estate plan. There are a number of ways to distribute the property after the owner's death. Some of the more common options are wills, trusts, joint ownership, or transfer on death (TOD) deeds. Note: unless identified otherwise, all definitions originated with Black's Law Dictionary, Eighth Edition. Wills are probably the first thing people think of when considering how to handle their assets. More specifically known as a last will and testament, this is the most recent document by which a person directs his or her estate to be distributed upon death. Regardless of other available tools, almost everyone should have something in place for this purpose. A well-constructed will reinforces other estate planning strategies, such as a trust or a transfer on death instrument. On the surface, wills appear simple, and they can be, but their complexity tends to increase quickly. In addition, changes demand a review of the entire document, and can incur legal and filing fees associated with every update. Real property distributed by a will must pass through probate, which adds time and expense to the process. Provisions exist to simplify things for smaller estates, but otherwise, both wills and probate can be tricky and are best approached by an attorney. A trust is a property interest held by one person (the trustee) at the request of another (the settlor) for the benefit of a third party (the beneficiary). The structure and purpose can vary -- there are dozens of different kinds of trusts, and variations within each type. They can exist independently from a will (nontestamentary), or be triggered by provisions found in a will (testamentary). It is important to seek legal guidance when arranging a trust because the wrong choice can have serious financial consequences. Because of these and other issues, it makes sense to consult an attorney to construct, administer, and modify a trust. Survivorship tenancy is a form of shared ownership that identifies the joint owner's right to the whole title upon the death of the other joint owner. The remaining owner(s) gains the title as a function of law, meaning it happens almost automatically (in theory). Three primary forms of property ownership support the right of survivorship: most joint tenancy, tenancy by the entirety, and some community property. Note that tenancy by the entirety and community property are only available to couples who are either married or in a legal civil union. For clarity, the right of survivorship must be written into the portion of the deed that identifies how the owners will hold title to the property. The exact format and wording may vary by state, but something along the lines of "John Doe and Jane Doe, as joint tenants with right of survivorship, and not as tenants in common." Survivorship tenancies can lead to potential complications. For example, the property could be at risk if one owner has credit problems or other financial issues. Real estate held this way cannot be included in a will except by the last surviving owner. Any sale or transfer of the property requires participation from all co-tenants or the joint tenancy is broken and changes to tenancy in common. Life is unpredictable, and sometimes the best way to handle an unexpected situation is to change or even revoke (cancel) a beneficiary designation. The established tools discussed above can be cumbersome and expensive to modify, and savvy clients needed more flexibility in their estate planning. Enhanced life estate, or "Ladybird" deeds, originated as the earliest direct answer to those demands. These deeds provided land owners with a responsive, non-probate option to direct the distribution of their real estate after death. They build on the premise of the life estate, which immediately transfers ownership of property to the grantee/beneficiary, but allows someone else named in the document to live there for the remainder of his/her life. Traditional life tenants have little or no control over what happens to the property after they die. The "enhanced" part comes in with the reservation of powers to the grantor/owner on an otherwise standard warranty, grant, or quitclaim deed. When executed, grantors transfer the property to one or more grantees/beneficiaries, but convey a life estate back to themselves, and reserve the power to sell the property outright, change or revoke the future transfer, or otherwise use the real estate as they wish, with no restrictions other than the requirement to formally record the changes during their natural lives. This reservation of powers enables land owners to retain full title rights, preserving their homestead status (if claimed) as well as any deductions, protections, and tax exemptions associated with the real estate during their lifetimes. The remainder, if any, goes to the named grantees/beneficiaries after the owner's death, thereby avoiding the probate process. Ladybird deeds are most common in Michigan, Florida, California, and Rhode Island. Even though they have been used and accepted for years, enhanced life estate deeds are not generally statutory (Rhode Island is one exception. See R.I.G.L. 34-4-2.1). Some states decided to take the concept of an enhanced life estate a step further and include laws for real property transfers on death (TOD) in their statutes. For example, Arizona (A.R.S. section 33-405) and Colorado (C.R.S. 15.15.401, et seq.) offer statutory beneficiary deeds. Ohio codified its transfer on death designation affidavit at ORC 5302.22 et seq. While Ladybird and beneficiary deeds, as well as other state-specific instruments are still in use, a newer, but related, approach is gaining popularity -- a transfer on death deed under the Uniform Real Property Transfer on Death Act (URPTODA). Unlike wills, trusts, or survivorship tenancies, which tend to follow the same rules across the US, TOD instruments vary according to each state's interpretation and application of the law. Completed in 2009, the URPTODA describes the Uniform Law Commission's process to unify and standardize the use of these non-probate transfers. In addition to the associated definitions and rules, the Act contains model forms for both a deed and a revocation instrument. So far, Alaska, Hawaii, Washington, Oregon, Nevada, North Dakota, South Dakota, Nebraska, New Mexico, Illinois, West Virginia, Virginia, the District of Columbia, and most recently, Texas have chosen to enact the URPTODA, modified as needed to incorporate existing state laws and customs. All initial and subsequent documents related to the transfer on death must be executed and recorded, in the county where the property is situated, during the owner's natural life or they have no effect. Executing transfer on death instruments requires the same competency as a will does. Transfers on death only convey the owner's interest in the property, if any, present at the time of death. Owners retain full title and absolute control over the real estate, its use, and its distribution until death. Beneficiaries have no rights to or interest in the property during the owner's lifetime. The form must state that the transfer is revocable. The power to revoke is at the heart of transfer on death instruments. Because of this feature, there is no obligation for the owner to provide notice to or collect consideration from the beneficiary (consideration implies a transfer of ownership that is not present here). Even so, many grantors inform beneficiaries about the potential transfer in order to save confusion later. The property is taken with all restrictions, easements, and debts in place, including mortgages. TOD instruments must meet state and local content and format requirements for real estate deeds. Convey all interest in the property to someone who is uninvolved with the original transfer. This option is possible because the owner retains full ownership of the property, and also because there is no consideration associated with TOD instruments. The procedure to collect the property transferred at death often differs from state to state. Generally, the beneficiary records an official copy of the owner's death certificate, accompanied by an affidavit containing details about the interest conveyed and the recorded TOD instrument. Some states simplify the situation and include a specific affidavit form in their statutes. Transfer on death deeds have some potential drawbacks, though. For example, recorded transfers on death might interfere with eligibility for state and federal assistance programs, and could trigger an estate recovery process for recipients of Medicaid's long term care benefits. In addition, some people might encounter difficulty obtaining title insurance or mortgaging the property when such documents appear in a title search. In most cases, beneficiaries take the property with no warranties of title, which could leave them at risk from outside claims against the property if there were any irregularities in the ownership history (chain of title). Two or more beneficiaries vest as tenants in common, meaning that they each get an individual share of the title. There are some exceptions, though, especially with enhanced life estate deeds, so consult a local attorney with specific questions. Property held jointly requires both owners to join in the TOD deed to ensure transfer to the named beneficiary. Otherwise, the transfer could be invalidated because the property is automatically distributed to the remaining co-owners. Survivorship tenants wishing to execute TOD deeds should review state laws concerning joint tenancy, or seek legal advice. Transfer on death instruments are flexible and convenient, and offer owners of real property a responsive tool for estate planning. Even so, they are not necessarily appropriate for everyone. Each circumstance is unique, so take the time to review and understand the relevant laws and customs. Finally, don't hesitate to contact an attorney with specific questions or for complex situations. Save time and money. Get your real estate document done right the first time. Each state has its own statutory requirements for transfer on death deed forms. These requirements determine the content or text that is in the deed. Transfer on death deed forms must meet statutory conditions for content and format. In addition, many local recording authorities add requirements for margins, paper size, property identification, and many other details. If a deed form is not in accordance with both the local and state standards, there may be additional fees charged for recording or the form may be rejected altogether. The right form matters. With transfer on death deeds, the little things can make a big difference. Deeds.com is meticulous about creating reliable and useful documents. All of our transfer on death deed forms are available immediately after purchase. They are in Adobe PDF files and can be downloaded to your computer. They are fill-in-the blank on your computer so you can print them out completed. State laws, or statutes, determine the content of transfer on death deeds. Find out more about your state's requirements by clicking on the state where the property is located below.